At least 3,731 terrorists have been "neutralized" in Operation Olive Branch since it was launched in northwestern Syria's Afrin, President Recep Tayyip Erdoğan said Friday. 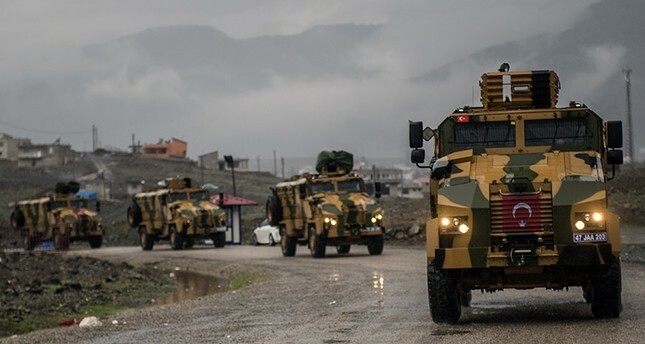 The Turkish Armed Forces (TSK) uses the term "neutralized" in reference to terrorists captured dead or alive, or those who surrendered during the operations. However, the term is usually used for the terrorists who were killed in the operations. Speaking at an event in Istanbul's Bağcılar district, Erdoğan said that he discussed the ongoing counter-terror operation with U.S. President Donald Trump on Thursday, and with Russian President Vladimir Putin on Wednesday. The president underlined that Turkey will continue to protect the victims of the Syrian war, adding that it would not take a step back in its anti-terror operations. "The work won't stop in Afrin, there is also Idlib, Manbij," Erdoğan said, signaling the continuation of Operation Olive Branch. Operation Olive Branch was launched by Turkey on Jan. 20 to remove the PKK/PYD/YPG/KCK and Daesh terrorists from Afrin in northwestern Syria. The Turkish Armed Forces (TSK) and the Free Syrian Army (FSA) entered Afrin town center and liberated it from terrorists on March 18. According to the Turkish General Staff, the operation aims to establish security and stability along Turkish borders and in the region as well as to protect Syrian people from the oppression and cruelty of terrorists. The operation is being carried out under the framework of Turkey's rights within international law, U.N. Security Council resolutions, its right to self-defense under the U.N. charter and respect for Syria's territorial integrity, it said. The military also said, "utmost importance" is being placed on not harming any civilians. The operation in Afrin – bordering Turkey's Hatay and Kilis provinces – was widely expected in the wake of Turkey's Operation Euphrates Shield in northern Syria, which cleared Daesh terrorists from Turkey's border between Aug. 24, 2016, and March 2017. On March 18, Turkish-backed troops liberated the town center of Afrin, which had been a major hideout for the YPG/PKK since 2012 when the Assad regime in Syria left the city to the terror group without putting up a fight.